Who CARES what it’s called. It’s easy and delicious. First of all, I’d like to apologize for my lack of doing food lately… it’s not that I haven’t been doing food, it’s that I haven’t felt like writing about it. Too much life getting in the way. But I’ve got a few moments to breathe now and I’m ready to get back to this blog thing. I think. Secondly, I’d like to apologize for not taking better pictures of the meal I’m sharing today… sometimes I start cooking and realize about halfway through that I should take some pictures to share… this time, I realized it at the very end. Like when I was eating it. Oops. Sorry. I try to cook healthy and eat healthy most of the time. Cooking good takes time. Sometimes, I’m tired and I’m tired of cooking and I’m really not feeling like food is what I want to be doing and sometimes, I really really really want something that might not be the healthiest option out there and that doesn’t take forever to prepare… and I’ll make it with the healthiest ingredients I can find. Sometimes, there’s not a super healthy option for an ingredient and I have to use that can of Ro-Tel anyway. My easiest-ever-go-to-one dish meal – one without a real name in our house – is that meal. I know I can make it for the kids and they scarf it down. Possibly want seconds. Definitely want it in their lunch the next day. It gives my husband only mild indigestion (although it’s certainly not his choice for dinner on any day of the week) but I guess he’s just hungry enough to eat it and suffer a little. The best part is that I can have it (lovingly) thrown together and on the table in about an hour. And I think it tastes even better the next day, if there’s any left. It’s filling, it’s tasty, and it’s easy. Did I mention it was pretty easy to make? 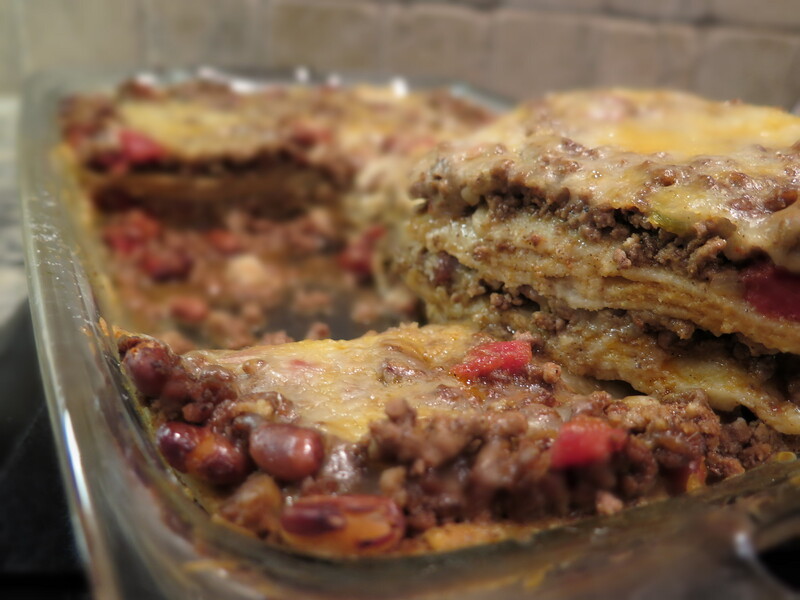 Without further babbling, I give you Krysta’s Enchilada Casserole/Taco Layered Pie/Mexican Lasagna/That Good Stuff with Taco Meat and Tortillas and Cheese and Beans. NOTE: Do not EVER use low-fat cheese. DON’T USE LOW-FAT ANYTHING AND THINK YOU ARE BEING HEALTHY. YOU ARE WRONG. Low-fat means sugar has been added. And taste has been removed. Our bodies need good fats – but that’s a story for another day. And anyway, everything low-fat tastes terrrrrrrible. Brown your ground beef, drain it and add your taco seasoning. I make my own blend with New Mexico Chile powder, garlic, salt, pepper, cumin and dehydrated onions. I also like the Fiesta Brand. Whatever your favorite is, use it. Make you some taco meat. Now, here comes the tricky part… open the can of beans. Drain it. Dump it in with the meat. Stir. Open the can of Ro-Tel. Do NOT drain it. DO NOT DRAIN IT. Dump it in with the meat and the beans. Stir it all up real good. 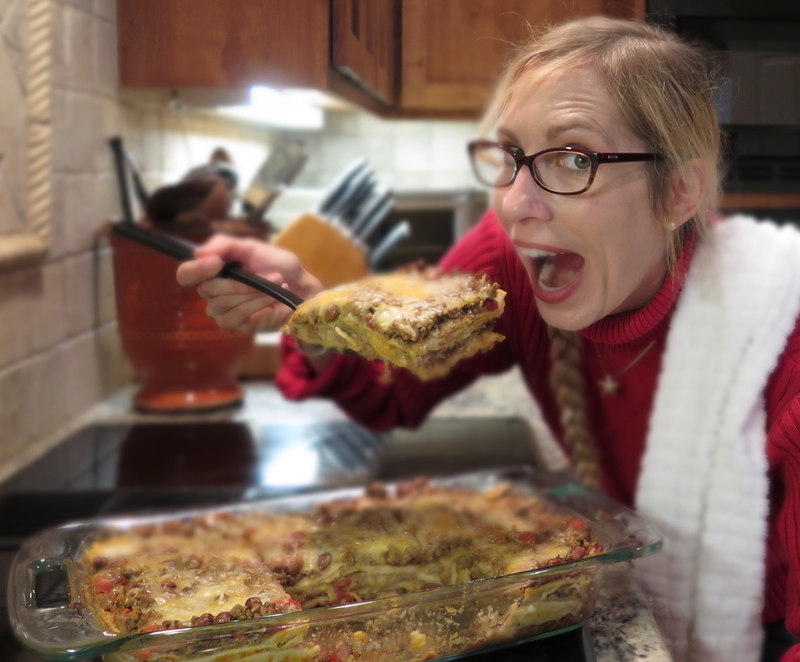 When I first found a recipe for this, I had everything in separate pans on the stove, carefully layering each item … and then one day realized I was wasting precious energy and doing extra dishes for things that were going to get all mixed together anyway. So I mixed it all together and made magic. You want the meat/bean/Ro-Tel mixture to be a little brothy, so if it’s not, add a little water and let it simmer for a few minutes. Find a 9×13 pan. Using a ladle (or a big spoon or a coffee mug – just something that will pick up the meat mixture and some of the juicy goodness with each scoop) spread about a cup on the bottom of the pan. Tear up corn tortillas – or leave them whole (it’s up to you) – and put a double layer of tortillas on top of what you just put in the pan. Next, layer the meat/bean/RoTel mixture, add a layer of shredded cheese over it, and add another layer of corn tortillas. Do that a couple of times. There are no real rules here. For your final layer, make sure it’s the meat mixture and a final and generous sprinkling of cheese. There can never be too much cheese. Unless you’re lactose intolerant, then there’s always too much cheese. I love cheese. Cheese it up. Cover the pan with foil, heat it up at 375 degrees for about half an hour. Remove it from the oven and let it sit for a few minutes before digging in. Enjoy that full belly and all the free time you have now that everyone is fed and you only have a skillet, a ladle and some dinner plates to clean up. Yay! Another to add to Mom’s Harvest Soup – Your Way! I’ve made the soup twice so far …. LOVE IT. I’ll be whipping up this lil number after the holidays when I’m too pooped to pucker. Let me add that not only do I appreciate the delicious food ideas, I really enjoy the laughs I am sure to get with each post. Love you, girlie! Previous Previous post: Krysta Likes Her Shrimp Spicy. Next Next post: I scream, you scream, BUT I scream LOUDER because I HAVE COFFEE ICE CREAM!